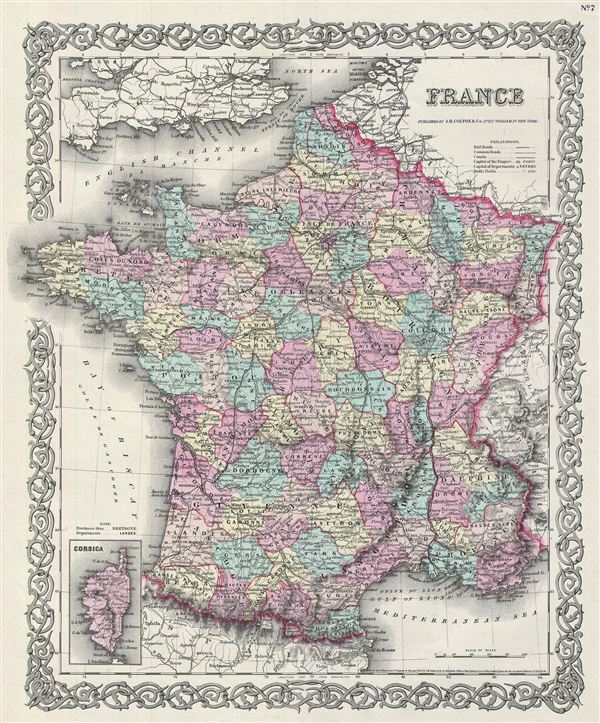 An excellent 1855 first edition example of Colton's map of France. Like most of Colton's europe maps, this map was derived from an earlier wall map of the World produced by Colton and D. Griffing Johnson. The map covers all of France subdivided according to its various departments. An inset map on the lower left corner details Corsica. Also shows parts of adjacent Switzerland, Sardinia, Spain and england. The French Department system was established on March 4th, 1790 by the National Constituent Assembly to replace the provinces with what the Assembly deemed a more rational structure. They were designed to deliberately break up France's historical regions in an attempt to erase cultural differences and build a more homogeneous nation. Initially there were 83 departments but by 1800 that number increased to roughly 130 (only to be reduced again to 86 following the collapse of the French empire). Many of the departments that were created in 1790 remain the administrative districts to this day. This map also identifies various cities, towns, forts, rivers, rapids, mountain passes, fords, and an assortment of additional topographical details. Map is hand colored in pink, green, yellow and blue pastels to define national and regional boundaries. Surrounded by Colton's typical spiral motif border. Dated and copyrighted to J. H. Colton, 1855. Published from Colton's 172 William Street Office in New York City. Issued as page no. 7 in volume 2 of Colton's 1856 Atlas of the World. Rumsey 0149.074 (1856 edition). Phillips (Atlases) 816.